The final round of the Rise of the Gladiator 2 tournament went down Saturday night at the HOME Bar in Arlington Heights and four fighters were awarded title belts and contracts to fight in the XFO. 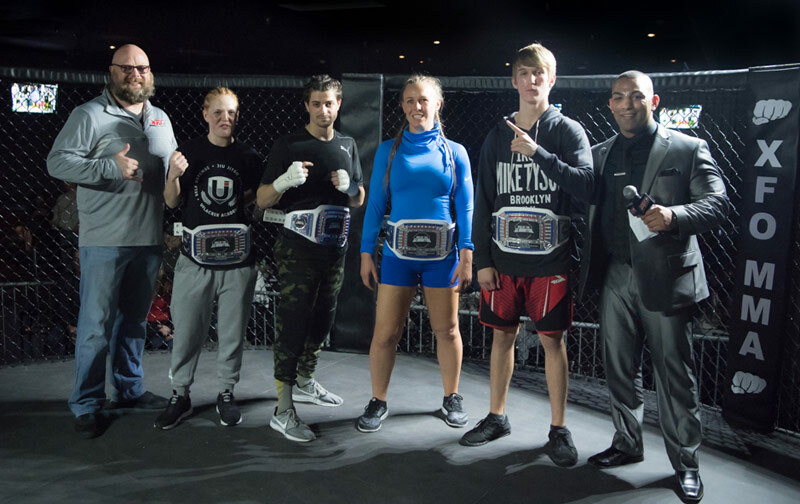 UFC Gym’s Mike Jaber and XFO owner/promoter Dan Lardy had to make some tough decisions, but they awarded the belts and contracts to Chris Houlihan, Kim Bulow, Marcus MacRae, and Heather Shedd. MacRae not only earned a belt and contract, he also avenged a narrow split decision loss in a rematch with Jerry Haaser from the first round. MacRae delivered a brutal knockout finish at just 1:18 of the first round. Bulow once again thrilled the crowd with her aggressive style and constant pressure, using her ferocity and powerful top game to beat Anita Sterling by unanimous decision. She went undefeated in the tournament. Houlihan went 3-0 in the tournament and finished all three of his fights. He submitted Andy Garcia with a triangle choke to cap off his perfect run. Shedd knocked out Emily Hoogesteger in the second round of the tournament but featured her slick ground game in an armbar win over Lauren Collins at the finale. The rest of the card’s results are below.